I don't usually listen to audiobooks with my husband. In fact, this was the first time we've ever done that--but we were down to one car and when I had to take him to work in the morning, it was just too early for any kind of conversation. I had this title in my Audible queue and, since my husband (like every other man alive! 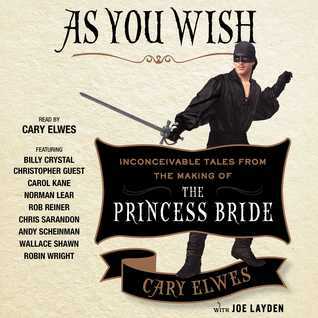 ), loves The Princess Bride, I thought it would be a good choice. I'm not sure what else I can say other than I loved it and my husband loved it and we were both a bit sad when it was over. This is like coming home to an old friend. I mean, everyone has seen The Princess Bride (and, if you haven't, you need to go over to the nearest TV, turn it on, and go through the channels until you come to it. It is always on TV! ), and most people have seen it multiple times. I actually saw it in the theater, which was apparently rare. I remember being a little perplexed by it, but it was fun enough. By the time I got to college, it was such a cult hit that the local movie theater was having showings of it in the style of The Rocky Horror Picture Show, where people would dress up and yell along with the movie. Because of all that--and the fact that my husband seems to watch it every.single.time. he sees it on TV, I was pretty sure this would be a hit--and it was. Cary Elwes is a very good narrator--most of the time, he speaks clearly, with just enough animation to keep you enthralled and then....he starts doing impressions. Really! And they are fabulous! There are also recorded bits by Rob Reiner and many of the actors (Mandy Patinkin and Fred Savage contributed to the book, but their words are read by someone else..not sure why....) This in itself was cool, with one rather surreal "exception." Well, maybe not exception, and it is a completely circumstance personal. You see, in my mind, most of the actors in this show are really associated with their character...except one. When I think of Robin Wright, I don't immediately think of Princess Buttercup. It isn't that she was bad in that role (she was quite good! ), but in my mind she will always be Claire Underwood and so, when she spoke, I always had to remind myself, "Buttercup! Not Claire!" I do think that my husband would take longer routes to work so that he could listen to more of this, and I didn't mind at all This was one of the most delightful listening experiences I've ever had. If you are a fan of The Princess Bride (and who isn't? ), get your hands on this one!